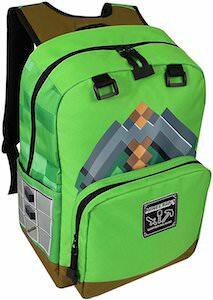 If you like Minecraft and need a new backpack then you want to check out this Minecraft adventure backpack. The backpack is green on the outside and has many Minecraft details like a pickaxe on the back and the craft recipe of a stone sword and even on the strap you can find a compass and a torch so all you need to do next is mine. Inside the backpack has lots of room and compartments for things like books, laptop, lunch and much more. It is a 17 x 12 inch tall backpack made by JINX and is just perfect for school, work, and adventures. Come take a closer look at this Minecraft Adventure Backpack. 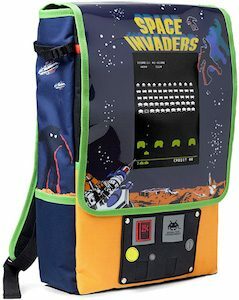 If you like classic console games then you will like this Space Invaders backpack as it does look a lot like a true arcade game. The backpack is a bit square to make it look more like a true arcade cabinet and on the backpack, you can see the Space Invaders screen and even the money slot that can actually take a coin. And this backpack is just perfect for school, work, and other adventures. 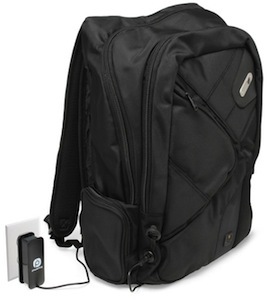 It offers a bunch of pockets and even a laptop sleeve. So if you like classic video games and need a new backpack then come check out this Space Invaders Console Backpack. The Nintendo Entertainment System or in short NES is one of those classic gaming consoles the world could not have done without and now there is a backpack that looks just like this video game console. The officially licensed backpack is the same color and has the details you expect. There are even look alike ports and buttons and zipper pulls that look like the controllers. At 12 x 18 x 6 inch this NES backpack is plenty big for many tasks like school, work and fun and inside there is a padded pocket as well so that you can take you laptop where ever you go and maybe run a NES emulator on it to be in the right mindset. 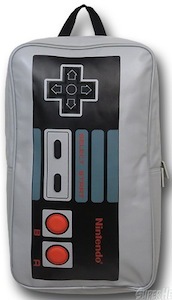 Come check out this great looking Nintendo Entertainment System Backpack. If you little one needs a backpack for preschool or a visit to the grandparents then this backpack could be perfect. 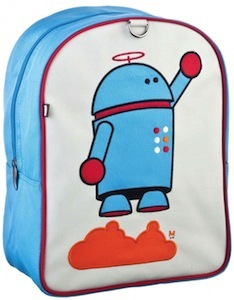 This backpack looks like a little robot and he wears a hat with a propellor so he should be able to fly and that is why he is called “Flybot” The backpack comes in blue (picture) and orange. 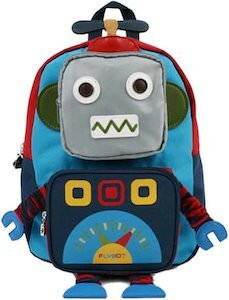 The robot backpack is 10.19 x 7.8 x 3.9 inch and is made from cloth to make it soft and even more fun. And this robot backpack is looking for a home one where kids live that love robots that can take him out for walks and stuff. Come check out this Flybot Robot Kids Backpack. There is Yoshi the fun dinosaur from the Nintendo video games. 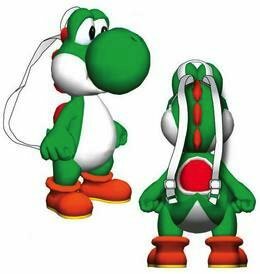 And this time you can take Yoshi with you where ever you go as he is plush backpack. This Yoshi backpack comes in a range of colors just like the real Yoshi. 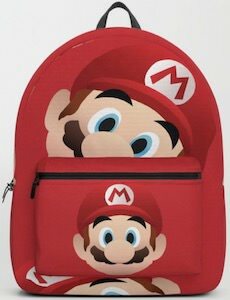 A backpack like this is great for everyday use or just to take to your friends with your new video games in it. What ever you are planning to do with it this Yoshi plush backpack will make you even more popular. Come and have a closer look at this Yoshi Plush Backpack. Kids need a bag to because they need to bring all that stuff to daycare, preschool, family visits or just to see friends. This little backpack is for kids ages 2 – and is made by Beatrix New York. As you can see the backpack is light blue on the sides and white on the front and on there you see a robot flying above an orange cloud. This kids backpack is easy to clean and has an extra wide compartment so that it offers plenty of storage room. Get your kid ready to travel the world with this Robot Backpack For Little Kids. How cool would it be to after a whole summer of playing video games you go back to school with a nice video game controller backpack? It would be almost as nice as playing those games. And now you can because there is the Nintendo controller backpack. It looks like a controller and is shaped like a Nintendo controller but it is a backpack. The backpack has plenty of room for books and stuff but clearly the only thing that really matters is how awesome it looks. And this backpack has a dual zipper with amazing little Nintendo controllers as zipper pulls. OK enough just come and order your Nintendo Controller Backpack. 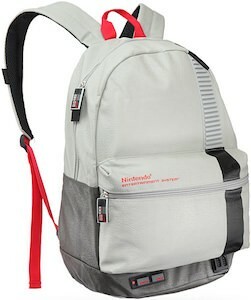 Maybe not yet but a backpack we can always use for fun, work and also for school. This is a large Angry Birds backpack and this is a black backpack with a big picture of Red Bird on it and the words Angry Birds. The Red Bird backpack has one big main compartment and on front of that a smaller zipper compartment and it also has two side pockets. 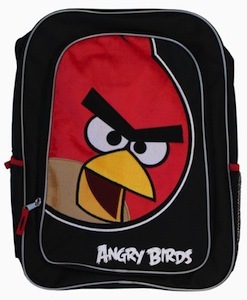 Now you can be the cool one again when you show your friends you Angry Birds backpack. So don’t wait order you own Angry Birds Red Bird Large Backpack.